On Sunday, the New York Times’ Sunday Book Review will weigh in on The Baseball Codes, but those who can’t wait to read it can already find it online. This bias clearly does not work in our favor. Still, the book is referred to as casual sociology, which was intended, and Weber takes the time to recount four stories from within its pages (not bad for a review of fewer than 900 words). Also, he manages to call us “obvious baseball obsessives,” which is nice. Kevin Lager just came out with the best review yet in the “I haven’t actually read the book” category. He admitted as much up front. Still, it didn’t stop him from giving 5 out of 5 (stars? points?) to the cover; two thumbs up for the fact that it was a collaboration; an A+ for the title; a “perfect 10” for the subtitle (despite our clear bias against Canadians); and an “E for Excellent” on the back-of-book copy (“If you’re going to read the back of one book this spring, make it the back of The Baseball Codes”). Thanks, Kevin. Can’t wait to hear what you think of it once you actually open the thing. 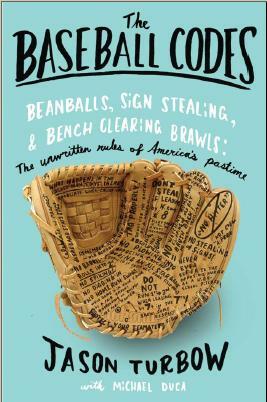 Starting with the headline – “The Baseball Codes: Attention Baseball Fans, This Book Will Eat Your Life” – NPR’s Web site review, which came out this morning, is, frankly, stunning. “I can’t say enough nice things about this book, which belongs on every fan’s shelf, and I really don’t say that lightly. The verdict is in from the Associated Press. They like it. Turbow and Duca are press box regulars at AT&T Park – Duca was the official scorer for Jonathan Sanchez’s no-hitter — and I’ve seen them collecting material for this book nearly every day at the ballpark for the past three years. It’s bound to be packed with a lot of great, funny anecdotes and the positive praise is already starting to filter in. I’m looking forward to buying a copy, myself. Nice to get some appreciation from the hometown set. Thanks, Bags.